MG over at Chasing Mailboxes has recently instituted the 2nd Annual Coffeeneuring Challenge. The rules are mostly simple: bike to at least 7 coffee shops in 6 weekends, document the rides, and participate socially. There are a few other rules at the above link, but that's the gist of it. The challenge began the weekend of October 6. 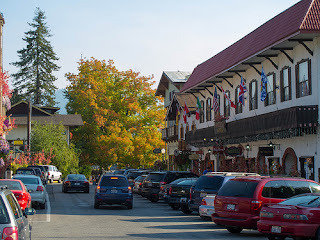 On that day, my wife Kasia & I (and a couple of friends) participated in the Leavenworth Oktoberfest Half Marathon in Leavenworth, WA. I knew my legs wouldn't feel up to a ride the day of the event, but I brought my bike anyway. I'm glad I did! I got a nice 8.2 mile ride in the Sunday after the half marathon. 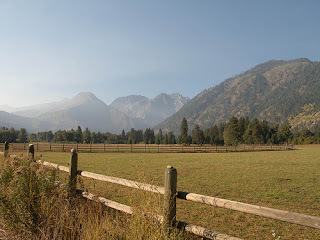 I started from the Alpen Rose Inn, near the intersection of Icicle Road and Highway 2, just before 10:00am. Front Street (the main touristy drag through town) was already getting crowded. Luckily, the area is so cramped that the drivers have no choice but to proceed slowly. It was a pleasant ride, with the fall foliage putting on quite a show. 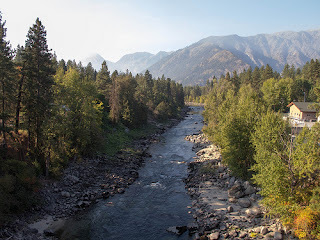 After leaving Front Street and rejoining Highway 2, I crossed over the scenic Wenatchee River. From there, a right turn put me onto East Levenworth Road. This road meandered through some lovely fields and offered beautiful views of the surrounding mountains. The views were great, but kinda hazy -- smoke from nearby wildfires still hung in the air. Eventually, East Leavenworth Road intersected Icicle Road. 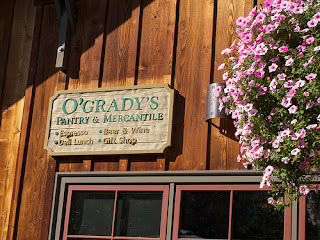 A left turn and short ride led me to O'Grady's, my coffee destination for the day. I ordered my usual drink of choice: small double-shot Americano, black. The coffee was strong but smooth, and scorching hot (much appreciated on this chilly morning). 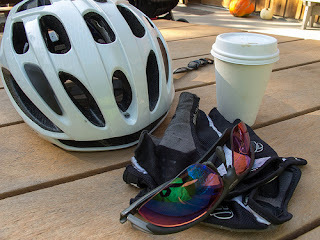 Bikes & coffee -- does it get any better? After draining my cup slowly (see "scorching hot" above), I hit the road and rode back to the hotel. It was a beautiful day for a ride, an excellent morning for coffee , and an awesome way to begin the Coffeeneuring Challenge.